The portable Traveler is designed to fold and go with you on your travels! Take your trike wherever you travel! The Traveler is a folding trike designed to be portable, while still retaining the quality and comfort that make TerraTrikes such a joy to ride. Imagine taking your favorite ride with you on vacation, packing it in the camper or just being able to store it in a closet. In about the same amount of time it would take you to remove a bike or trike from a car rack, you can have the Traveler unloaded from your car’s trunk or back seat, unfolded and ready to ride. The frame hinges have been designed to be both easy to operate and flawlessly secure. The Traveler was developed from the ground up based on time-tested design parameters. The frame hinges have been engineered to be both easy to operate and flawlessly secure. The Traveler is available in two different component levels: external and n380 NuVinci. The frame, made of round chro-moly steel tubing, is painted a stunning Fire Engine Red. Built using the same high quality components and materials as our other models, the Traveler can become both a trike you take on vacation and your everyday ride. It is a great solution for anyone who needs to save space without sacrificing performance or comfort. It will quickly become your favorite way to explore the world, no matter where your travels take you. The seat height allows riders to easily get on and off, and provides good visibility and safety. The horizontal handlebar gives the rider responsive handling to steering inputs, and gives the Traveler a tight turning radius. The internal hub is maintenance free and allows the rider to shift easily while pedaling or when stopped. The external hub uses a traditional derailleur system. The hinges allow for smooth operation and feature a locking pin design to ensure secure closure and easy folding and unfolding. 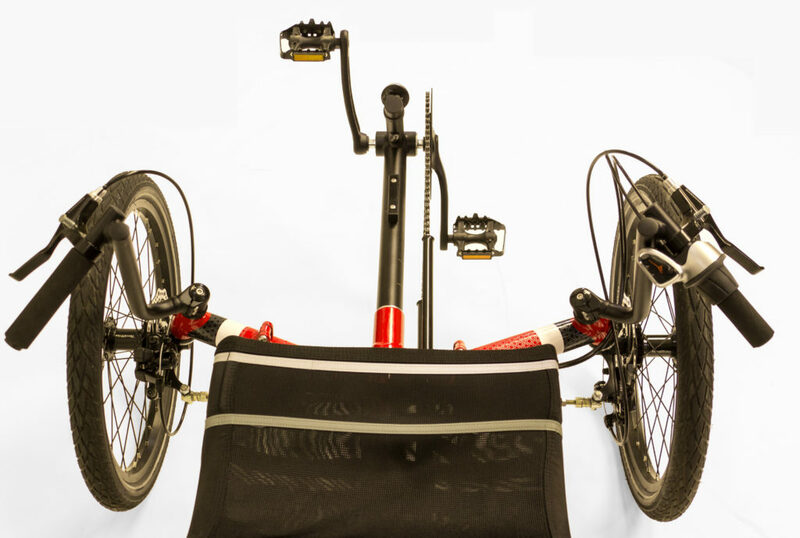 Our 3 hinge folds allow the trike to be stored in tight spaces. After purchasing a 2 wheel bike last year and falling off every time I got off (and sometimes on), I decided to give up on bike riding. Then my husband showed me the traveler. I thought it was a bit pricey, but oh my! Worth every penny. Not only did I not have to worry about falling, but the seat was more comfortable, my hands don’t go numb and I didn’t have to mess around figuring what gear was best. With the NuVinci gears, I just rotate the gear shift until it feels right and away I go! Love this bike! I have slightly over 100 miles on my TerraTrike Traveler and am extremely pleased. The quality of the build is second to none. It is as comfortable as I hoped it would be. I have added a rear mirror, a flag, rear light and a seat bag to make it perfect for me. I plan on taking it to Florida over the winter, folding it and putting it in my sailboat for the drive. A cool product that does everything I want!